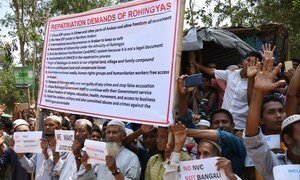 Representatives from the Office of the UN High Commissioner for Refugees (UNHCR), the UN Development Programme (UNDP) and the Government of Myanmar at the ceremony for the signing of the Memorandum of Understanding on Rohingya refugee returns to Myanmar. Nay Pyi Taw, Myanmar. 06 June 2018. 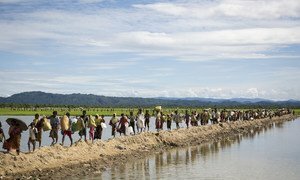 United Nations agencies and Myanmar have agreed a framework which it is hoped will lead to the repatriation of Rohingya refugees, but only if their “voluntary, safe, dignified and sustainable” return from camps in Bangladesh can be guaranteed.